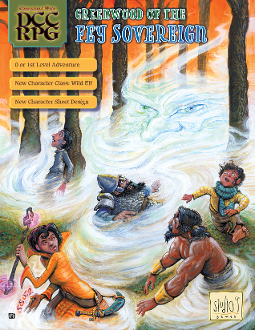 This 20-page, stand-alone adventure is created for the DCC RPG system as a softcover booklet. It can be adapted to any fantasy RPG system. The adventure is primarily for low-level characters and newer players. In testing, it was also enjoyed by veteran gamers of all ages. It is not setting specific and can be placed into any fantasy world near ancient woodlands. War is looming. The Earl of Nanch and his neighboring elven kingdom are sharpening the spears of aggression. Those on the border are split between two dangerous dynasts. Pressed into duty for lord and country, the peasants and gong farmers of Nanch find themselves in a strange and unnerving forest full of denizens older than the practice of naming. In this new world, the rules of life and death are a game of whimsy practiced by fantastic forces, and bizarre ancient feuds re-ignite in the chaos of war. Those errant attendants of Nanch will be fortunate to survive the madness of either ruler!